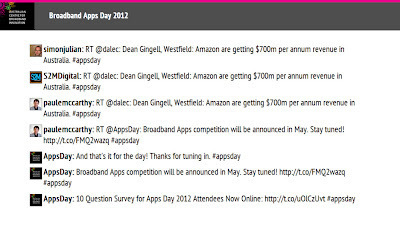 I posted over 100 tweets today under the username @AppsDay on behalf of the Australian Centre for Broadband Innovation's Broadband Apps Day 2012 at the Australian Technology Park. The day featured a speakers from organisations ranging from Google and Microsoft to Woolworths and Ausgrid discussing potential applications for the National Broadband Network (NBN) and the issues associated with them. Topics included home automation, health applications (including Dance Dance Revolution for seniors), application development and e-commerce. There was a disappointing lack of discussion on the security and privacy issues associated with these applications. For instance, a Samsung rep was spruiking the control of household whitegoods from their televisions, phones and tablets. Yet there was a recent report of vulnerabilities in Samsung electronics, one of which could cause endless restarts in their televisions. Who might be watching you on those televisions as well? The point about who owns your household data was also raised. Some of your devices like smart electricity and water meters may report directly back to suppliers via the NBN without the household owner being able to directly access that data. What about other devices sending usage information out to marketers. One speaker thought that users might want Harvey Norman to contact them to offer more energy saving devices based upon usage. That's actually quite scary. There is a lot to think about with the potential for a ubiquitous broadband network with similarly ubiquitous connected devices. A few speakers commented that the way people consumed entertainment has changed and that their children expected on demand video rather than traditional television and to interact with devices via touch, voice or gesture rather than the normal remote control. It's certainly been our experience with Alex. Rather than use the big work laptop I brought in my trusty Sony VAIO P to do the tweeting. The keyboard is great for fast typing and quiet. Even better it's light and cool - important if you don't have a desk. What I derived the most pleasure from was developing a web display of the conference tweets, which we put up on a big screen outside the lecture theatre. 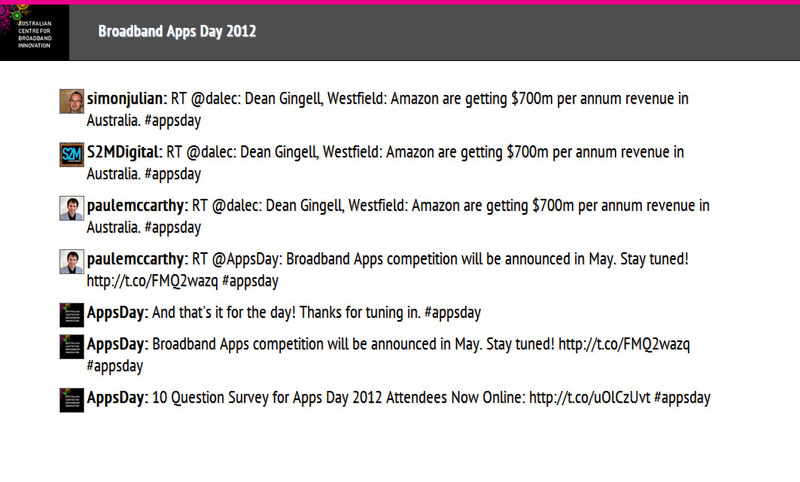 I wasn't happy with the lack of customisation options with other tools like Twitterfall, so I decided to write my own. The modern office is full of hazards and we aren't doing enough to make our employees aware of the dangers they face everyday from seemingly innocuous actions. For example, a simple paper cut can become infected, leading to limb amputation or even death. That is why I propose the following measures to help ensure a safe working environment. Every action item raised in a meeting should be accompanied by a full evaluation of the potential safety risks associated with that action. When a user clicks on a print button they should be presented with a screen which includes, but is not limited to, warning of the potential health implications of inhaling toner particles and the possibility for paper cuts. The user must accept that they have read the contents of the screen before the document will print. All documents should be prefaced by the above warnings and any others associated with activities specified within the document. This should be signed by the reader prior to their continuing on with reading the remaining contents of said document. The text of a document should also be interspersed with messages recommending that the reader stop reading and engage in a set of exercises designed to promote good circulation. For content designed to be viewed on a computer (for example; web pages) the content should be prefaced by instructions for setting up their computer environment to ensure the correct posture and optimal viewing, as well as listing hazards associated with printing the content. The viewer should click an acceptance button before they can proceed to the content. The content should also be interspersed with suggestions for regular exercise breaks. 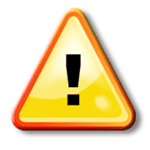 All staff should have a Safe Working Instructions (SWI) document associated with them. This should detail any risks associated with interactions with the staff member, including, but not limited to, potential sources of stress and sensitive topics likely to result in physical or verbal violence. The staff member should ensure that the SWI are kept up to date, including the potential health risks associated with any transmissible diseases that the staff member is currently suffering. To enable the potential interactee to formulate an optimal method of interaction the SWI should include risks associated all possible methods of disease transmission (respiratory, blood, sexual, etc). I would like to see a work environment where a Health and Safety Representative plays a role in every meeting, in every document written and in every personal interaction that takes place. Let's safety! Such a gorgeous Easter Saturday that we just couldn't stay at home. After some debate we drove down to Audley Weir in the Royal National Park. It's a pretty spot with traces of an old fashioned vacation spot. After a picnic by the river we hired a row boat for a couple of hours. I rowed while B and Alex relaxed. It was windy and both their hats escaped into the water, but we managed to retrieve them. Despite the number of fellow picnickers on the shore and aqua bikes, kayaks, canoes and rowboats on the river it really was very relaxing. The waters were clear, though often filled with water weed. Alex fell asleep for a little while. A number of other paddlers, generally in kayaks, ended up in the river. We had to laugh when we saw Mr Cool Muscles and his fashionable girlfriend walk past both drenched. Once we had returned the boat, with the wind still blowing strongly, we followed Alex's instructions and drove out to Ramsgate, on the shores of Botany Bay. There we unfurled his kite, gradually figuring out how to use it as seagulls attempted to mimic its flight in the air. Alex was more interested in building sandcastles on the beach (until he got sand in his eyes) or climbing around the playground. I watched the big jets fly southwards across Botany Bay, imagining myself in one.